In France, they always advise to eat 5 fruits or vegetables per day during television ads for food and drinks that are high in sugar or salt. I always feel guilty when I heard these ads. I am not really a fruit person you know. I will never grab a fresh fruit if I am a bit hungry. I will never think about eating an apple as a snack during the day. Usually I try to not eat outside main meals. Not that I am on diet but I do not want to take too much weight that I will be too lazy to lose next. If I am hungry, I drink water. It’s filling my body and I am not feeling hunger anymore. And if I want to eat a high fat snack that’s just because my brain need it not really my body. I like when fresh fruits are sliced and maybe mixed with others kind of fruits. The only one I eat just like that is strawberry. My favorite fruit. I know that the recipe below is not the best example of a healthy one but still that’s fruit 🙂 … with a tone of sugar on top of it. 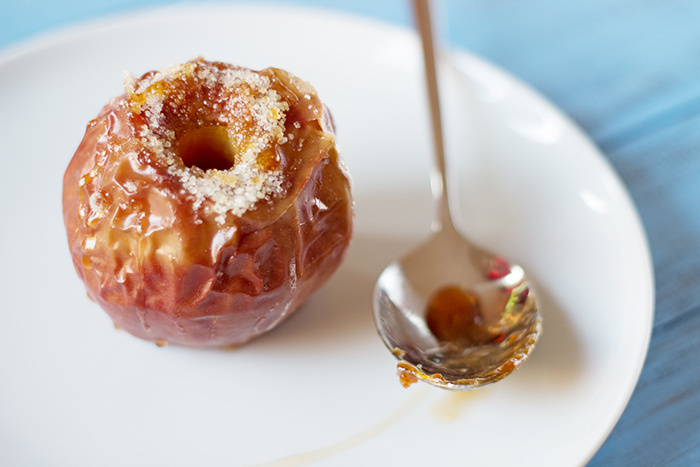 These baked apples will be loved by little ones and grown-ups. I think that’s the easiest dessert I have ever baked. During baking sugar melts becoming a delicious caramel. Let’s now look at the recipe. Wash and seed apples. Put apple in an oven dish. Add 2 tablespoons of sugar on top of each apple and bake for around 50 minutes. Thank you very much for reading. Register to the newsletter and follow me on social media to receive the latest recipes of a French girl “cuisine”. To find more dessert recipe, visit the recipe index. 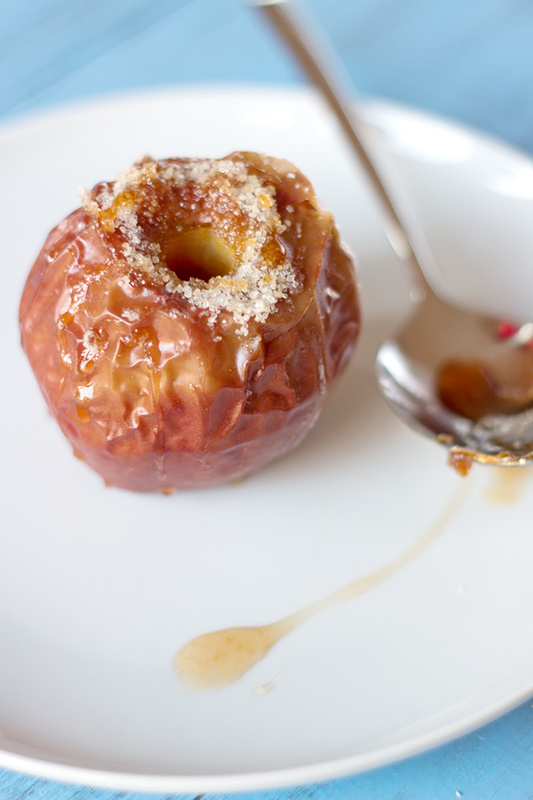 i love a simple baked apple like this when it gets cold! Me too. Simple and delicious!